Mayor Mufi Hannemann and Dennis Kamimura, at right, spoke yesterday on Real ID at a hearing of the Senate Homeland Security and Governmental Affairs subcommittee on government management oversight in Washington, D.C. The cost of implementing the national Real ID Act would place a heavy burden on the city's budget, Honolulu Mayor Mufi Hannemann told federal lawmakers yesterday. Initial costs for setting up the system would be about $7.7 million, with ongoing expenses expected to approach $18 million in the first five years of the program, he said. "Practical considerations aside, the City and County of Honolulu cannot afford to implement the requirements of the act without initial and continuing federal funding," the mayor said in testimony to a U.S. Senate Homeland Security and Government Affairs subcommittee. 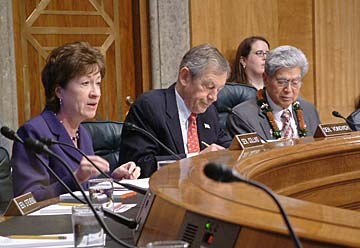 Hannemann testified in Washington at the invitation of U.S. Sen. Daniel Akaka, D-Hawaii, who chairs the subcommittee. The purpose of the hearing was for lawmakers to review the Real ID Act and proposed regulations issued March 1 by the Department of Homeland Security. Passed by Congress in 2005, the act was intended to combat terrorism by imposing stringent new identification requirements. Citizens would need to obtain a federally approved Real ID card to enter federal buildings and to board airplanes, while the act also would set up electronic databases of information that could be shared among states. Many states have criticized it as an expensive unfunded mandate that raises serious privacy concerns. 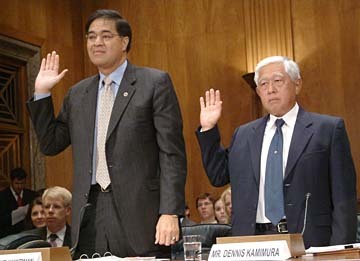 U.S. Sen. Daniel Akaka, pictured at far right, invited the mayor to testify. To the left of Akaka are Republican Sens. George Voinovich and Susan M. Collins. Maine and Idaho have passed resolutions to opt out of the program. Hawaii and 12 other states have passed similar resolutions in at least one legislative chamber critical of the act, according to the American Civil Liberties Union. "The Senate of the State of Hawaii supports the repeal of the Real ID Act of 2005 and urges the Hawaii congressional delegation to support any legislation that calls for the repeal, amendment, or, at a minimum, the provision of proper funding for the implementation of the Real ID Act of 2005," states Hawaii Senate Resolution 13. The White House defended the program yesterday and called it a priority because it could safeguard the nation from another terrorist strike. "The 9/11 attacks cost 3,000 lives and $64 billion in immediate losses followed by longer-term financial losses of $375 billion," said Richard C. Barth, assistant secretary for policy development at the Department of Homeland Security. "The potential for further loss of life and property far outweighs the financial burdens to states and territories." Earlier this month, the Bush administration gave states an extra 18 months to comply with the law and create the new IDs. The deadline is now Dec. 31, 2009. Akaka said he shared the concerns that the act is a "serious threat" to the privacy of Americans, saying the massive amounts of electronically stored information "could provide one-stop shopping for identity thieves." Akaka has co-sponsored a proposal to amend the more controversial provisions of the act. Barth said claims about the program eroding privacy are "simply not true." "Real ID does not give the federal government any greater access to the information than it had before," he said. Hannemann said funding was a primary concern for Honolulu. However, even if full funding is provided, the deadlines for having the system in place would place an "enormous burden" on the driver's licensing and identification offices in Honolulu and the rest of the state, he added. Cox News Service contributed to this report.